The Current Probe is designed for exploring the basic principles of electricity. 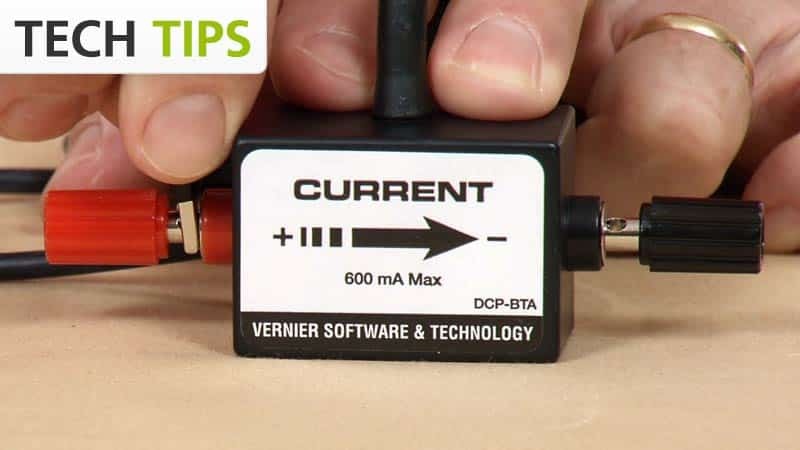 Use the Current Probe to measure currents in low voltage AC and DC circuits. With a range of ±0.6 A, this sensor is ideal for use in most “battery and bulb” circuits. Note: Vernier products are designed for educational use. Our products are not designed nor recommended for any industrial, medical, or commercial process such as life support, patient diagnosis, control of a manufacturing process, or industrial testing of any kind. The Current Probe was designed to look like it should be wired in series with the circuit. Currents in either direction can be measured. The current will be indicated as positive if current flows in the direction of the arrow on the small box (from the red terminal to the black terminal). The range is ±0.6 A (±600 mA). You should not have to perform a new calibration when using the Current Probe in the classroom. A stored calibration is set for the sensor before it is shipped. Simply use the appropriate calibration file that is stored in the data-collection program from Vernier. If you choose to calibrate the Current Probe for increased accuracy, use the standard, two-point calibration procedure. Another option to consider instead of calibrating is “zeroing” the sensor. This is done by shorting out the leads of the sensor, then choosing the Zero option in the data-collection software. This option adjusts the calibration offset but does not adjust the calibration gain. The Current Probe contains a sensing element and signal conditioning amplifier. The sensing element is a 0.1 Ω resistor connected between the red and black terminals. As the current passes through the resistor, a small potential difference is measured across this resistor. This potential difference is input to the signal conditioning amplifier. The final result is that a voltage is produced from the amplifier that can be measured by the lab interface. The output of the Current Probe is linear with respect to the measurement it is making. The built-in amplifier allows you to measure positive and negative currents on any Vernier interface. Since many lab interfaces can read voltages only in the range of 0 to 5 volts, the amplifier offsets and amplifies the incoming signal so that the output is always in the range of 0 to 5 volts. If an input is zero amperes, for example, the amplifier will produce an output of 2.5 volts. The output varies from this 2.5 volt level, depending on the input. If the Current Probe is not operating as expected, plug the probe into an interface and run the data-collection program. Use wire leads to connect the probe to a DC power supply in series with a known resistance. Use a voltage probe or voltmeter to measure the voltage of the supply. Compare the measured current against the current calculated from Ohm’s law. Note: We recommend a battery for this test, since some DC power supplies may not deliver clean DC voltage. If you have watched the related product video(s), followed the troubleshooting steps, and are still having trouble with your Current Probe, contact Vernier Technical Support at support@vernier.com or call 888-837-6437. Support specialists will work with you to determine if the unit needs to be sent in for repair. At that time, a Return Merchandise Authorization (RMA) number will be issued and instructions will be communicated on how to return the unit for repair.